Wow Clare, What an amazing giveaway. I usually live too far away from most Craft Fairs, but the Doncaster Show is something I could mangae. It would be lovely to win and meet you (in the flesh) after seeing you on tv. Having just started to learn about and embrace crafts as my new hobby, this event would be perfect to attend, to get supplies and hopefully some useful hints and tips too! Plus the event is happening in my home town so i can easily attend! It would be lovely to win, for the extra goodies, but i will be buying tickets anyway if i don't as it's too good an opportunity to miss! Hi Clare, I always go to Paula and Gary's shows twice a year as I believe it's great to give them the Support they have given to us, I go to Paula's Craft Class weekly which is extremely helpful and can be fun also, I think it's Fabulous that you are so kind in supporting them by going to the show is this The first time you will have visited The Doncaster Which Craft Show for Paula, will you be taking Graphic 45 Products Please say Yes I Love the Product so much! And your a Awesome Designer. I'm aware there's the large Summer Crafting Show at The Race Course but I prefer to go to Paula's she always has some great Demonstrators there I will see you there Clare and hope to say Hello. Wished I lived over there so I could attend. I'm a big fan of your projects and to win would be the bees knees! TFS. Hi Clare, Woweeeeeeeeeee !!! thank you, thank you, thank you, for the opportunity to win these tickets to Doncaster Show, my fingers are crossed. 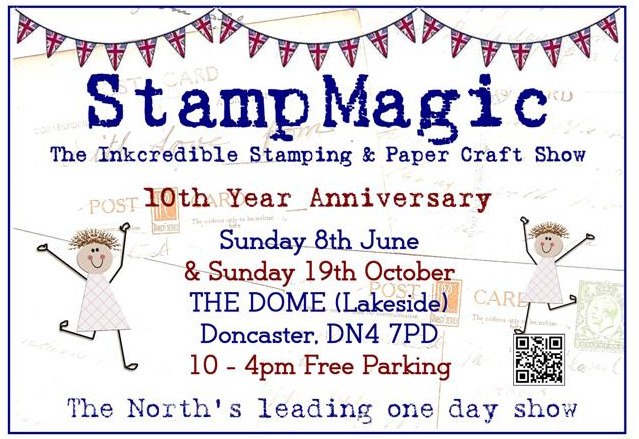 This is a fabulous show at Doncaster with fabulous friendly exhibitors and demonstrators. Thanks for offering this generous prize. hi Clare, thank you would love a chance to win these tickets to Doncaster show, I always attend this fabulous show, great stands and lovely friendly people.